The Cover Story ("Falling Star") in the weekend's edition of Barron's is about the case for a hard landing in China. China has become such a large part of the world's economy that it deserves a serious look at the possibility that China has a hard landing. THIS STORY is the single best overview of the dangers facing the Chinese economy that I have read, where so many topics are nicely tied together. I am going to comment at length on this article because I think it is important. -- Jim Chanos, famous China bear (at least recently). Chanos has been a short seller of certain Chinese stocks (banks and real estate developers) as well as miners like Rio Tinto (ticker: RIO) and Brazil's Vale (VALE). Laing: "...Chanos contends that China is headed for a hard landing of epic proportions because of its shaky financial system and an imminent collapse in its property market..."
Chanos himself told Barron's: "I'm being conservative when I say that the coming bust in China's real estate marketwill be a thousand times that of Dubai." -- Edward Chancellor (global strategist at Boston-based GMO) says that China has all the earmarks of a classic mania that will end badly. Chancellor then goes on to say that he sees over-investment in fixed assets with inadequate returns. A toxic combination! -- Laing even brings in Paul Krugman, who who wrote in 1994 "The Myth of Asia's Miracle". Krugman writes that China just threw in large amounts of "economic inputs" (labor and, yes, capital) to get their growth up (like the USSR in the 1950s and Japan in the 1960s), but that state directed economies will run into diminishing returns on brute force economic methods like that. Laing then goes on to write that Chinese consumption is actually FALLING (vs. government investment) and shows us this with a graph. His other graph shows the record level of new residential real estate as a % of GDP at a record high. -- A street shot in Kangbashi, China (a city built for a million people but inhabited just a few thousand) in which there are just TWO on the eight lane road between the (empty) apartment buildings. Of course Laing could be cherry-picking photos, but they are still compelling. Laing brings in longtime China expert Kenneth Lieberthal (Brookings Institution) who again mentions that mal-invesments like duplication of facilities and fancy government buildings (that's a red flag). Much of this investment was made with relatively short-term loans coming due soon... And inadequate returns on those investments. Yet another expert Laing brings in (Peterson Institute economist Nicholas Lardy) who notes that last year residential construction accounted for 9.2% of the Chinese economy, compare that to OUR peak of 6% in 2006... Among major countries only Spain reached numbers like China's, and look what has happened there. Yow! OK, OK, I will not be sending any money to China (except to buy some bearings). Alan Abelson goes on to have some fun at the pundits' expense! Hey, I guessed wrong too, though. I was very surprised when I heard that the SCOTUS ruled that the individual mandate part of Obamacare was constitutional. At first that news dragged the Dow down 177 points, but that mostly was recovered by day's end. And Friday's news of a great new deal in Europe sent the Dow up over 270 points... Happy Days are here again! He then goes on to write about Friday's upcoming JOBS NUMBER, which is the one getting the most attention nowadays (along with their almost always revised higher previous figures...). Abelson finishes with remarks supporting Jonathan Laing's piece on China! Michael Santoli ("Streetwise") presents a kind of bullish case for stocks summer, based on his view that many indicators are less scary than in 2011. No comment. "The not noticed as much as it should have been" story of Stockton, California is mentioned on Page 12 ("Review & Preview", Page 12 my edition). It is the largest bankruptcy ever for a US city, both in population of the city and the amount of debt ($700 million). Vito J. Racanelli writes of Fiat and Chrysler. Fiat owns 58.5% of Chrysler, and was kind-of brought in to save Chrysler you may recall (the other 41.5% of Chrysler is owned by an entity of the UAW, that should comfort you, ha!). Chrysler and Fiat CEO Sergio Marchionne has made some impressive strides with Chrysler now to the point where Fiat is now learning from them. The first product of this marriage is the new Dodge Dart, the main problem with that (if it is even a good car...) is that it is going up against tough competition like the Honda Civic, the Toyota Corolla (disclosure: my wife LOVES her Corolla) and the Ford Focus. 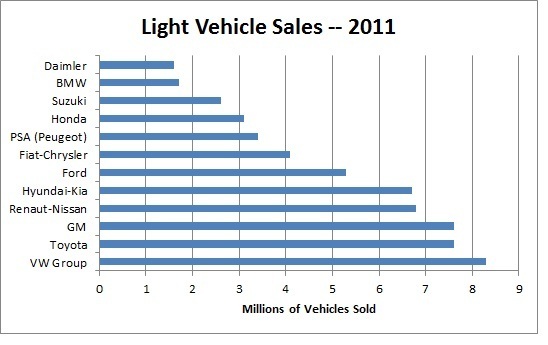 All other world manufacturers sold a total of 16.8 million vehicles (world total 76 million units). I was kind of surprised that VW Group was Number One! Chinese vehicle sales must represent a large proportion of VW's vehicle sales. Kopin Tan writes of the likely winners and losers in the wake of the SCOTUS Obamacare decision. Of the four sectors he writes the most about (Hospitals, Managed Care, Drug Makers and Medical Equipment), he sees it as a mixed bag (more customers but more regulations). He then writes that diagnostic and testing companies like Lab Corp (LH) and Quest (DGX) might do well as well as pharmacy chains like Rite-Aid (RAD). "CEO Spotlight" this week features International Paper (IP) CEO John Faraci. IP has repaired itself! It was as low as under 8 in early 2009, it is back up to $27.89 way outperforming the S&P. IP now has a big joint venture in Russia (home to two-thirds of softwood trees), as well as a JV in India. But, not in China! They SELL to China. Faraci, recalling the advice of a friend: "You can't lose a lot of money in China unless you're there." Tiernan Ray ("Technology Week") writes that the tech sector is getting pummeled. Short version: slow growth. -- Obamacare bans insurance companies from NOT selling to people with pre-existing conditions. What this means is that there is no NEED for anyone healthy to buy insurance, just the fine (er, tax), and when something bad comes along re your health, THEN you buy the insurance! -- The good news is that the IRS will hire 10,000 more enforcers! Editor Thomas Donlan thinks that even if the Republicans win it all (President and Senate) they will be unable to undo Obamacare, at least in great part. Ugh! But, they will be able undo the fine/tax, repeal part of the Medicaid eligibility (Oh, my back hurts, and I'm poor), additional prescription drug benefits, etc., that fall under legislative budget rules and so do not need a 60 vote majority. But, it looks like, according to Donlan, we are stuck with at least part of Obamacare from here on out. In the Market Week section, there is not a whole lot that caught my interest, I guess they saved the "good stuff" (for me) in the China and Fiat-Chrysler articles. Randall W. Forsyth ("Current Yield") notes that Treasury yields went back up in last week's "on risk" rally. There were no BIG insider buys or sales last week, but two buys caught my eye. "Commodities Corner" author Marshall Eckblad this weeks looks at the lean-hog market. Prices look like they will go down, as hog production is suffering to some degree because of the heat wave as well as China and South Korean production is up. An insider bought $299,000 worth of Schlumberger (SLB). ANother insider bought $249,000 worth of Sunoco Logistics Partners (SXL). By coincidence a very good friend of mine will soon start work with Sunoco Logistics. Great comments about the coming, or has it already come, Crash. Seriously, you have done your homework! As for the Health Care Act, I hardly know anyone, who speaks well of Obama, but that worries me more. If you remember, Argentina tried to tax the wealthy class under Peron to give to the poor...not sure, if that occurred.